Proud to be from Toledo? We have the perfect metal sign for you! 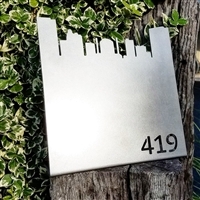 Our metal Toledo sign makes a great gift for the nostalgic who are missing the 419, or anyone who still calls the Glass City home. We love this rustic sign perched on a shelf or mantel. It would also look great on a desk! Produced locally by Toledo's own Boxcar Metal Company! Specs: 11.75"W x 5.75"H x 2" base. Weighs 13.93oz. Looking for a different city? Send us a message and let us help you create a custom sign! A GearUp419 Exclusive! Proud to be from Toledo? We have the perfect metal magnet board for you! Self-standing and portable with a 3" base. Makes a great gift for the nostalgic who are missing the 419, or anyone who still calls the Glass City home. Produced locally by Toledo's own Boxcar Metal Company! Specs: 9.5"W x 9.5""H x 3" Base. Weighs 27.2 oz.